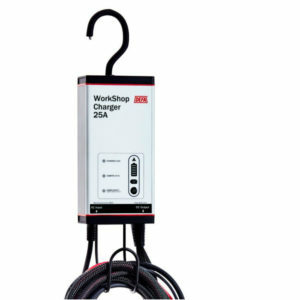 The WorkShopCharger is designed to give you the power, simplicity and flexibility that you need. It's both a charger and a 13,7V Powersupply and has all the functionality needed in the workshop. The WorkShopCharger uses switch-mode technology, galvanic isolation and a temperature compensated charging cycle. It provides excellent efficiency, protects the vehicles electronics and maintains the performance of the battery. The WorkShopCharger can also recondition bad batteries with automatically controlled software. The WorkShopCharger lets you access every function via a single button. Monitor the charging cycle in the award-winning display, and activate Powersupply by holding the ‘On’ button for 5 seconds. The WorkShopCharger also has a rubber coated hook that enables you to hang the charger on the vehicle while working. 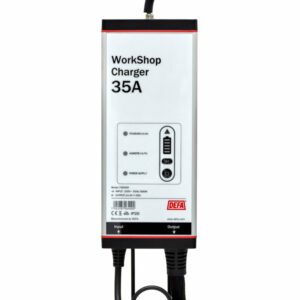 WorkShopChargers are sturdy, durable and safe. They are also spark free, short circuit proof and fully secured against reverse polarity. A compact design and low weight makes WorkShopChargers easy to handle.